As I mentioned in my last post, Shaunagh and I shared a birthday 2 weeks ago, and our celebration at scrapbooking was a brilliant one with cake, presents, loads of laughter and of course a few cupcakes. Having recently fallen in love with a few new blogs including Sam Linsell’s blog http://drizzleanddip.com/ with her exciting recipes and mouthwateringly beautiful photography I decided to try out a new recipe for Shaunagh’s birthday cupcakes from Sam’s blog. Her Best Ever Red Velvet Cupcakes looked really tempting and true to her word these cupcakes not only looked red and chocolatey but also tasted delicious. 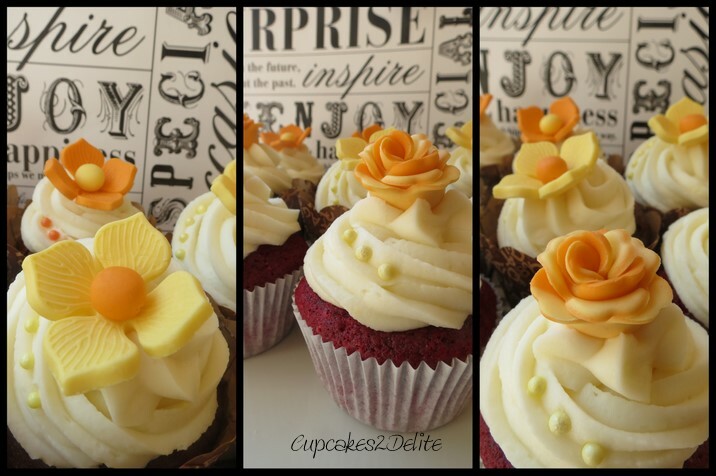 I added some pretty orange and yellow flowers with bright centres to some of the cupcakes and then combined the yellow and orange sugar paste to make some roses for the others. 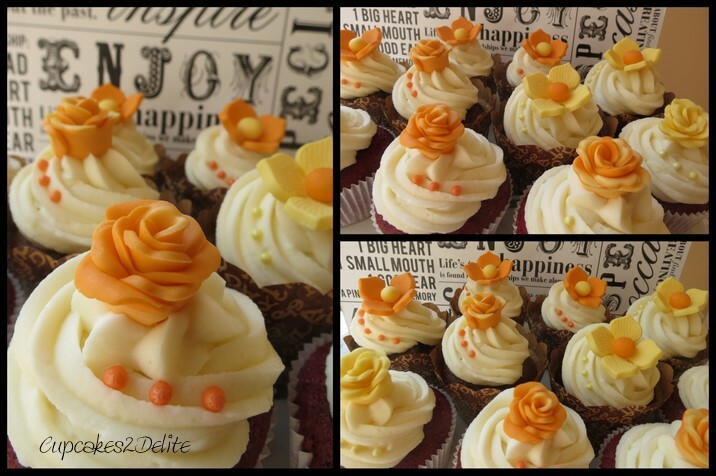 The result was cupcakes that are as bright and fun as Shaunagh herself is with a beautiful feminine finish. Inspired by the beautiful flowers Shaunagh researches on the internet and then makes for gifts and for her beautiful layouts, these were my way of capturing her fun spirit. Thanks again for sharing a wonderful birthday celebration and especially thanks for all the laughs every week! ← My Giant Birthday Cupcake!